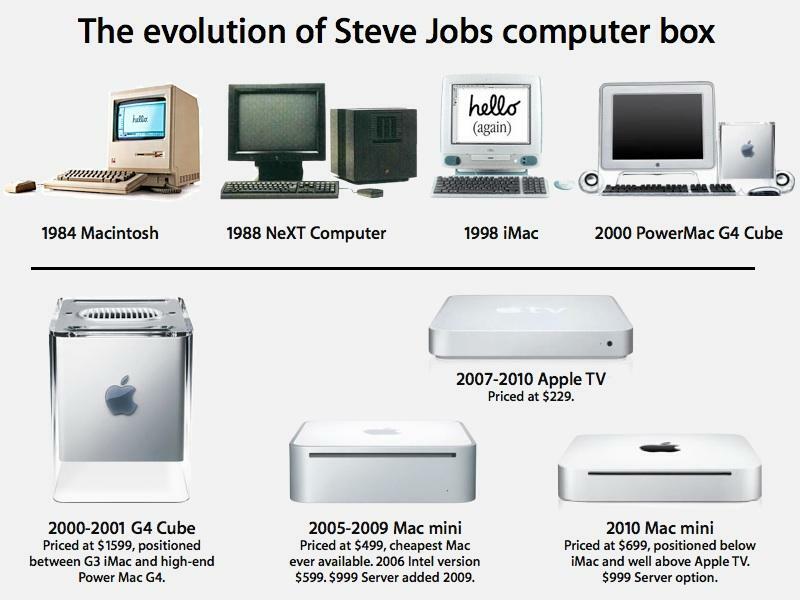 In 2011, Apple set new sales records for its 27 year old Mac platform, hitting a milestone of 4.89 million Macs sold in the fiscal Q4 ending in September, a number 700,000 units larger that the previous year's record quarter of sales. 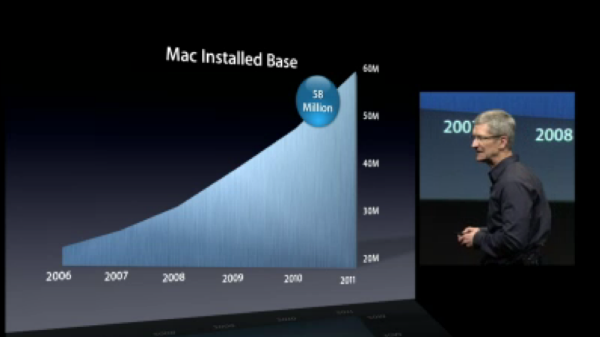 Just five years ago, Apple was selling 5.4 million Macs per year (hitting a quarterly peak of 1.6 million Macs in Q4 2006). Those sales were considered strong at the time, but after a half decade of introducing new Intel-based Macs the company's hardware sales have more than tripled, resulting in an installed base of more than 58 million users. Compared to the 4 percent annual growth of the overall PC market, Apple has experienced six times the growth of the industry, with a 23 percent increase in Mac sales over the past year, even when excluding sales figures for the iOS-based iPad. 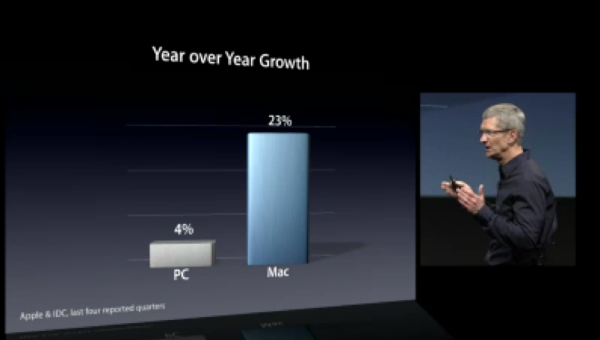 Including iPad sales, Apple is now positioned to become the world's largest PC vendor by the middle of next year. Apple officially retired its Xserve line at the beginning of the year, and introduced no new Mac Pro to replace last year's "Mid-2010" model, moves that signaled a departure from conventional PC and server markets and an intensified focus on mobile systems. In its most recent conference call, Apple reported that mobile Macs now make up 74 percent of its computer sales. In large part, that's because the company launched two new waves of MacBook Pro models featuring powerful new Sandy Bridge i5 and i7 processors, AMD graphics and the fast new Thunderbolt interconnect, affording its mobile systems a degree of power and expandability previously only available in a desktop tower. The new models also introduced fast 450 Mbps WiFi and higher quality FaceTime HD cameras. In the summer, Apple introduced new MacBook Air models incorporating mobile versions of Intel's Sandy Bridge i5 and i7 chips along with Thunderbolt and Bluetooth 4.0, repositioning the Air as its entry level notebook by eliminating the white plastic MacBook model. Apple also introduced new iMacs and a refreshed edition of its "unibody" Mac mini and Mac mini server that similarly incorporated the same faster CPUs and Thunderbolt connectivity features. 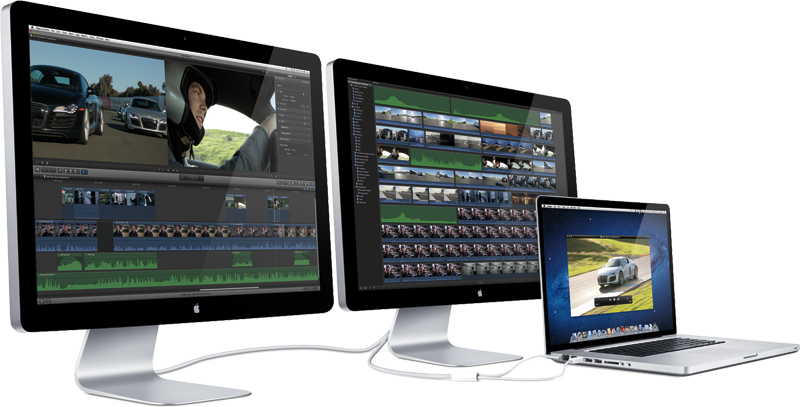 Thunderbolt enables new 2011 Macs the ability to drive two external displays (apart from the Air, which can power one) as well as serving as a conduit for PCI Express, supporting two bi-directional channels with transfer speeds up to 10Gbps each, all over a single cable. Apple also introduced its own 27 inch, $999 Thunderbolt Display providing 2.1 speaker sound, a FaceTime HD camera, 3 USB 2.0 ports, one Firewire 800, Gigabit Ethernet, and a Thunderbolt interface for connecting a chain of five additional devices.